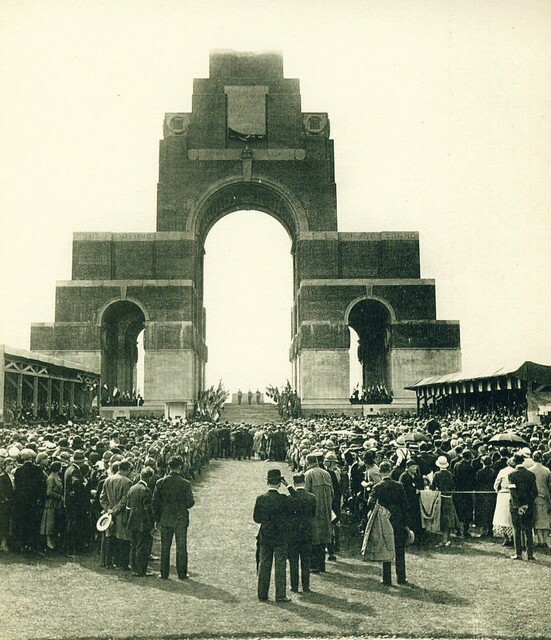 The Thiepval Memorial to the Missing was unveiled on 1st August 1932; we saw a few weeks ago the Last Post being played as part of the ceremony; here is an image of the assembled crowd who had travelled to the Somme for the inauguration ceremony that day. Such pilgrimages were not new – visitors had first been seen on the old battlefields in 1919 – and this was not even the first one to the Somme, yet it was the first large scale pilgrimage since the British Legion had organised their own in 1928. But this in many respects was a pilgrimage with a difference; here were not families who had come to see a grave. No wives or mothers or children could walk the rows of headstones to find one with ‘their’ name on. For these were the families of the legions of the missing; men who had ‘no known grave’. What to do with these missing? In previous wars such men had never been commemorated, but as this war had touched almost every family in the land, crossed every class and social barrier, and on some battlefields more than half the dead were missing, it was felt unfair for the loved ones of these men to have nothing to see, nothing to remember but a fading vision. The solution were the huge memorials to the missing, which in many places came to define the battlefields on which they stood. Future generations would make much of these memorials like Thiepval, and wonder at the long lists of names. But on this day, and in this crowd, all minds were focussed on but a single thought; of that name, that face, that voice which had once been dear to them and was lost. There had always been that feint hope; alive somewhere, lost their memory, perhaps missing no more, but now nearly two decades after the Somme the final reckoning; a name in stone, a final acceptance, and all the grief and heartache that brought. This entry was posted on 28/01/2012 by sommecourt. It was filed under Battlefields, France, Great War, Somme, War Memorial, Western Front, WW1 and was tagged with 1916, Battlefields, Pilgrimage, Somme, Thiepval. I visited Thiepval last year and no photo can ever do it justice. To see the wall upon wall of names is incredible. My G.G Uncle died at Archiet Le Grande, about 30 mins from here. Thankfully he has a grave I could visit unlike these poor people on the memorial.